Hastings College sophomore Benjamin Friend spent his summer doing his dream job—building a museum in the Wilkie Center at Indiana University. But it wasn’t just any museum; it was a temporary museum built to host artifacts, artwork and other Boy Scout relics for the biannual National Order of the Arrow Conference. Ben Friend (third from left), a sophomore at Hastings College, participated in a ribbon cutting ceremony for opening of the national Order of the Arrow (OA) conference. The national Order of the Arrow (OA) is a organization that recognizes Scouts who best exemplify the Boy Scout Oath and Law in all areas of their lives. The organization recognizes 150,000 members nationwide. The OA national conference brings together many groups, or lodges, of the OA to participate in events that last several days. Friend’s job concerned the building, maintenance and disassembly of the Goodman Edson Observatory. The conference was held from July 30 to August 4, but the planning stages of the museum began in December 2017. The museum spanned more than 12,000 square feet, containing 260 panels and 280 surfaces all together to hold memorabilia. It took five days to set up, was on display for four and then was torn down in 12 hours. The museum tells the story of OA through the relics it has on display, including drawings by Joshua Hunt, an influential member of the Boy Scout program, and paintings by Joseph Csatari, the Scouts official artist. 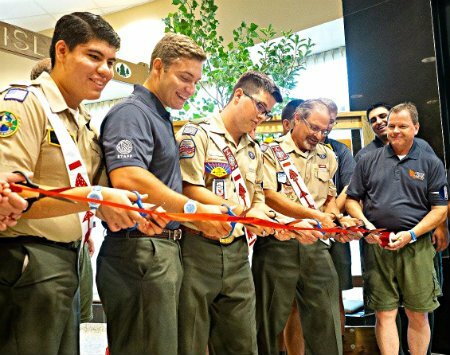 It hosted vintage uniforms, the copy of the first Boy Scout handbook and a kiosk donated by OA to the hosts of the first national conference to commemorate the first event. Along with hosting the temporary museum, the conference hosted a scavenger hunt, a special patch and a ribbon cutting ceremony that Friend aided in. Along with helping build the museum, Friend was also a lodge leader and was elected section chief by members of the organization, after fulfilling the requirements of being of first class rank and having completed 15 days and nights of camping. Friend said he loved the experience of having to lead a group of 62 people during the conference. Friend said his time at Hastings College prepared him for his work at the conference. Friend has aspirations of working in a museum after graduation, alongside making his own professional artwork. His opportunity at the OA conference gave him a chance to live those dreams, even if it was just for a summer.